Zumbathon – marathon zumba on the beach – to raise money for a new dog pound near Javea. Check the poster for more details and see the message from the organizers below. Beach Dancing Event by Zumba Costa Blanca supporting the APASA Javea dog kennel and their efforts to rescue dogs, make their lives better and find them new permanent homes. Please support the event and the magnificent effort by Zumba Costa Blanca – everything the event generates go directly to the welfare of the dogs in need! 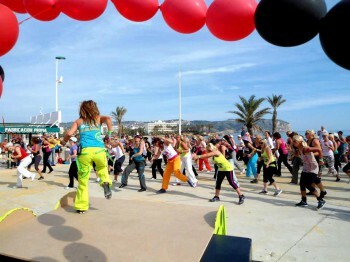 You’ll find a Zumbathon (2 hour dance event) right on the promenade on the Arenal, Javea on the 31st March. Everyone encouraged to come along and join in, no qualifications required, just a sense of humor and some drinking water! It’s all for APASA, Javea’s dog pound who are gravely in need of money. Some superb lottery gifts too, lots of cosmetics therapy options , dinners for two etc, so get your friends together and come enroll with the celebration! Fun days that help the dogs ! Join in and support the efforts!